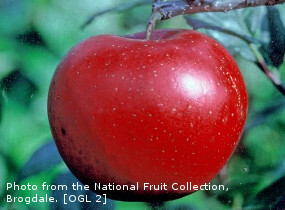 APPLE, RED DEVIL (Malus domestica Red Devil). Fruit. Excellent variety with superb fruity flavour. Striking scarlet flush; pink stained flesh, pink juice. Heavy cropper. Suitable for colder areas and is more resistant to frost. This plant is in pollination group 3 and requires a pollinator, choose a tree in group 2 or 3 (listed below).